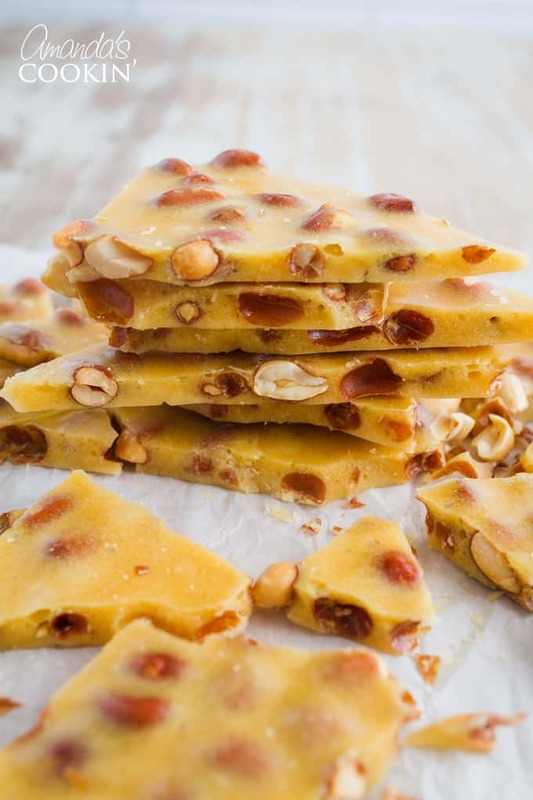 Peanut Brittle: treat your family to a big batch of delicious peanut brittle! 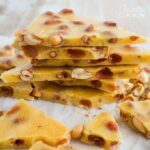 I’ve been making homemade peanut brittle since I was a young bride. When I was a teenager and living at home, my dad had a cookbook that I would experiment out of. Homemade peanut brittle was my very first attempt at using a candy thermometer. Needless to say, it didn’t go very well the first time. My parents were divorced and while I lived with my mom until the seventh grade, after that I lived with my dad. We were latchkey kids and both parents, no matter which house we were in, worked two jobs or long shifts to make ends meet. Therefore there wasn’t a whole lot of free time for either of them to teach me to cook or bake. So I often experimented on my own, sometimes with success and other times, not so much. 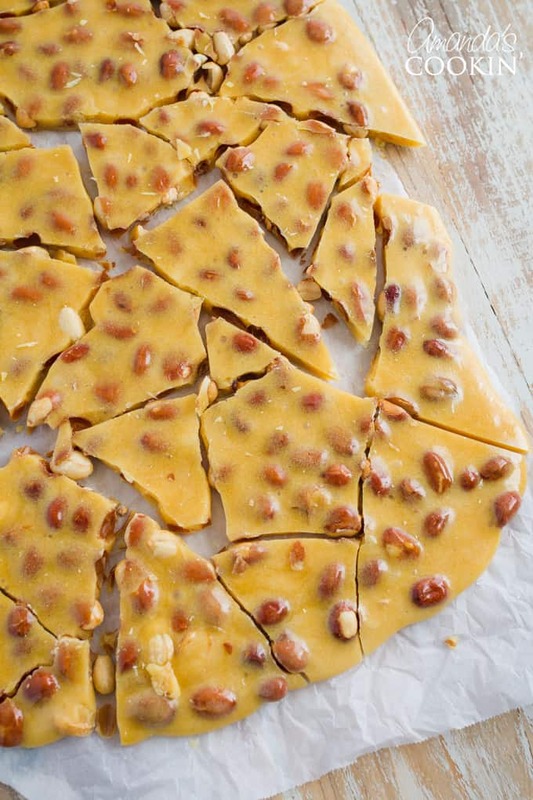 While the first time I tried this homemade peanut brittle I burned it, the second time I read the instructions more carefully and was triumphant. Seventeen years old and I had successfully boiled my first real batch of Christmas candy. Now here I am, more than 30 years later, still making that same homemade peanut brittle. I’ll admit, I had fallen off the candy making wagon for a few years (okay, about ten!) so when I whipped up this batch recently my boys wanted to know where it had been all their lives! To say they loved it was an understatement and they have insisted that it become a regular tradition again. So be it. This recipe is from The Good Housekeeping Illustrated Cookbook . There are several different versions of this book, the one I have linked is the one I have now and have had for over 20 years. I believe it was actually an earlier version that I used as a teenager, probably this one as the cover looks familiar and it’s a little earlier version. Either of these versions are an amazing reference for any cook or baker, and a wonderful book for a beginner as well. There’s a photo of every single recipe and many have step by step illustrations, plus very easy to understand instructions. The book is full of references, charts and guides. I highly recommend it to anyone! This is the most cherished cookbook in my collection. Measure out all the ingredients first. This is crucial as you won’t have time to measure things as you go along. This recipe requires that you work quickly when the candy is ready. Grease a cookie sheet with butter and set aside. In a heavy saucepan, combine sugar, corn syrup, salt, and water. Bring to a boil over MEDIUM heat, stirring until sugar has dissolved, about 10 minutes. Continue cooking, stirring frequently so the peanuts move around (they can brown too much if they sit at the bottom of the pan), until temperature on the candy thermometer reaches 300 degrees (hard-crack stage). Remove from heat and stir in the butter. Add baking soda and stir, then immediately pour onto prepared cookie sheet. Spread with a rubber spatula. Allow candy to cool completely then break into pieces. This post was originally published on this blog on Dec 3, 2014. 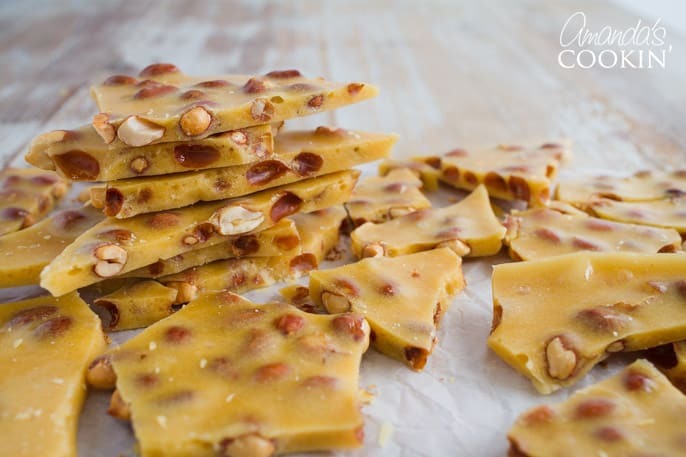 Homemade peanut brittle is a nostalgic treat at the holidays! It's fun to make and even better to eat. Measure out all the ingredients first. This is crucial as you won't have time to measure things as you go along. This recipe requires that you work quickly when the candy is ready. In a heavy saucepan, combine sugar, corn syrup, salt and water. Bring to a boil over MEDIUM heat, stirring until sugar has dissolved, about 10 minutes. Stir in peanuts. Continue cooking, stirring frequently so the peanuts move around (they can brown too much if they sit at the bottom of the pan), until temperature on the candy thermometer reaches 300 degrees (hard-crack stage). Remove from heat and stir in the butter. Add baking soda and stir, then immediately pour onto prepared cookie sheet. Spread with rubber spatula. Any reason I couldn’t use regular peanuts? I always make mine in the microwave…turns out good everytime and so easy. YUM! 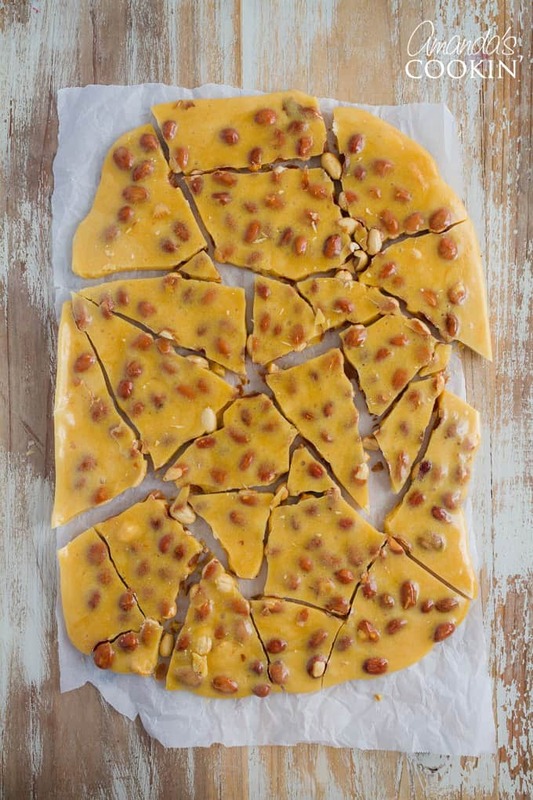 This brittle looks so good! 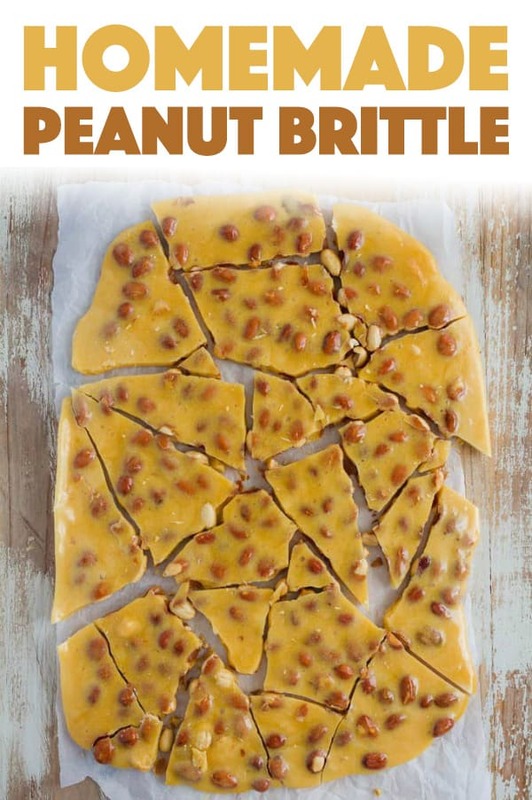 I’ve never tried to make peanut brittle but I know Thomas would love it! Have to make this soon! Yes, but keep in mind that you have to work quickly. So make sure you have two cookie sheets ready and you will need to use a larger pan like a Dutch oven.